A ninja writer is highly skilled. They are silent and strong in mind. A true ninja writer can overcome all obstacles. Have courage ninja writer. Against all odds and form rejections, a ninja writer must believe in their ability and rebound fast on the keyboard. A ninja writer must master the element of surprise on the mission to be published. 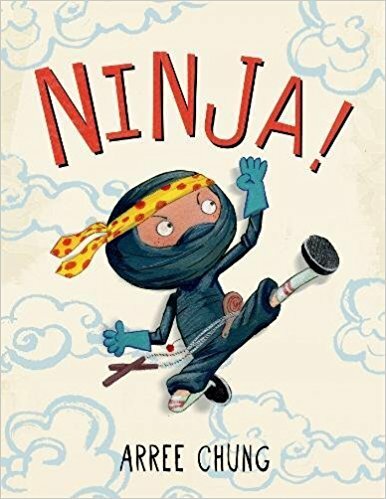 I was enlightened and selected my words for this intro by sneaking into this master storyteller's book--NINJA by Arree Chung. A ninja writer is one who endures many years of practicing their art. 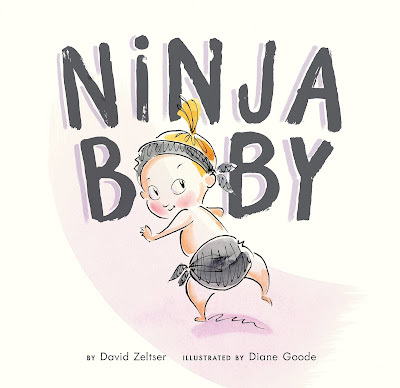 They exaggerate setting and characters in their story like NINJA BABY by David Zeltser. My favorite line is when the parents bring home a baby brother aka Kung Fu Master. "What's your secret?" she asked him. He just looked at her. It was like listening to the wind in the bamboo. Kiya! 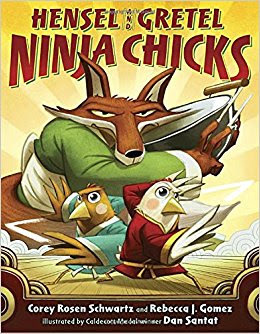 Get ready for a chance to get empowered not devoured by reading HENSEL AND GRETEL NINJA CHICKS by Corey Rosen Schwartz and Rebecca J. Gomez. The fox said, " Surrender? Your cheep little threats are absurd!" From then on the chicks made it their mission to rescue, protect, and defend. Now you are ready ninja writer. Use your mystical powers, follow a strict diet (of chocolate and perhaps wine) and go to work in your dojo. 1. Select a character type or combine two: eg. ninja, ballerina, pirate, baby. 2. Read picture books about your character type. 3. Make a word bank of terms from the picture books you read. 4. Brainstorm story ideas. Don't forget to karate kick in a surprise ending. 5. Play and practice your ninja writing skills. What obstacles are you overcoming in your writing? I'm feeling ever-so-much-more powerful (perhaps even ninja-like) after reading this post. Thanks, Janie! What a fun ninja voice, and I like how you applied the ninja theme to writing. Thanks, Janie! Fab post, Janie. I like your adaption of Arree's text to fit the situation. Such a creative, fun, puny post! Love the nod to Arree and your ReFo choices, Master Janie. I bow to your skills. This is SO fun! I love that we can think of our desk as a dojo. One where coffee and chocolate are allowed. Sue the ninja can accomplish much with special food. Perfect! You chopped that down to fun-size bites. Hi-yah! Arree is inspiring and so are you, Janie :) Love the way you ratchet the psyche with energy and wisdom! KIYA! I bow to you Charlotte. Happy we can work together in our dojo. A great set of steps to get into any kind of character. Great post, Janie! Very clever and Ninja worthy! Love this post! Very inspiring! Thanks, Amanda😊 May you be enlightened and hear the wind in the bamboo.